Journey To Heaven by Tammy Brodowski Mott and her father, Bruce Brodowski, is the touching life memoir of young Emmy Mott. Told through the eyes of a mother's heart, this young mother's tragic loss is shared from beginning to end in this poignant story of one young life that made a difference to many. Their journey is heartbreaking, yet inspiring, as the experience enriched all who came in contact with Emmy and her family. A remarkable true story of faith, perseverance and love that will leave an indelible imprint on your soul! Little 4 year-old Emmy Mott had been diagnosed with a rare brain stem cancer and was given only 8 weeks to live. As this devastating diagnosis was given, sweet Emmy still had that radiant smile. 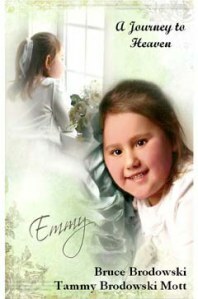 Emmy's journey to Heaven and their families' testimony will stir and amaze the deep emotions of the heart. Throughout the journey many lives, including doctors, nurses and family members, have been changed and enlightened due to Emmy's short time on this Earth. Many have come to Christ as a result and her family has learned many lessons of love and miracles. Emmy's story has been a labor of love, written from the mother's journal entries of each passing day of over a year since the diagnosis. One will come to know firsthand the heartache, and the extent that the family endeavored in order for little Emmy to live her short life to the fullest. The readers will appreciate the gift of life that each child is and your perspective for this Earth may be eternally changed after reading this book. Certainly this book will minister life to many that have experienced the loss of a child in that there is a tomorrow, the love of God never fails and hopefully readers will find hope that is not found in this world, but only in Jesus Christ. One will gain new perspective on life and Heaven as well. For more information about the author, the book and Emmy be sure to visit Journey To Heaven. You may also get your copy of Journey To Heaven by Tammy Brodowski Mott and Bruce Brodowski at Amazon, in Kindle Edition and at Barnes and Noble. This is a must read for everyone.